Bart is in his early twenties and has made his home with us since 2012. He arrived on a summer morning with his equine partner, Bubba. The two were surrendered by their owner who could no longer care for them. Bart was unsure that day, anxious, and even fearful. Over time, Bart slowly let his guard down. When he did, he revealed a huge heart of gold. Bart also revealed that his heart had been broken in the past, and he showed us signs of abuse that he endured. What he lived through previously, we will never truly know. In some ways, it does not truly matter. What matters most is the horse in front of us, now. What matters most is the Bart we know and love, now. What matters most is the Bart who has found refuge at Phoenix Rising. The Bart we now know and love has a soft eye, a sensitive spirit and a gentleness about him. At 18 hands [72 inches from ground to top of shoulder] and approximately 2000 pounds, this Bart would not intentionally hurt a fly; although, he is sometimes scared by one. This Bart enjoys being groomed by volunteers. He likes the kind touch of a child, the shade of ‘his’ tree, the safety of his stall, a consistent routine, and the comfort of knowing his other equine herd mates at the farm. 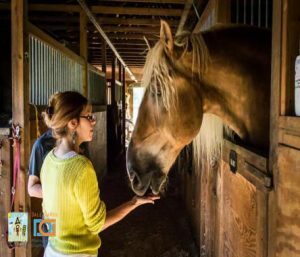 This Bart inspires those who are unsure of horses [especially big draft horses] to overcome their fears. Given his height, Bart towers over most things – people, fences. When you arrive at the farm, it is not unusual to see this blonde bombshell raising his head above all else to look out over the driveway to see who may have just arrived on the property. Given his weight, he can break most things – fences, stall doors. The stall door, behind which Bart finds peace, is reinforced with a board across it to ensure safety in case he leans against the door or decides to scratch himself against it. Given his size, Bart’s steps reverberate across the farm. The earth will literally move under your feet when Bart approaches. Often, people use the phrase ‘gentle giants’ when referring to Belgian draft horses. Our Bart is a gentle giant, indeed. We thank Bart for his quiet, yet strong will. We thank him for his calm, gentle presence in our lives. We thank him for allowing us to see deep inside of him. We thank him for teaching us that good things don’t just come in small packages. We thank him for reminding us to be still and take in the moment. We also thank all of the supporters of Phoenix Rising who allow us to offer a Safe Haven of Hope to Bart and other horses in need.